When you sell your home to Opendoor, you pay a service charge similar to how you’d pay a realtor commission in a traditional sale. 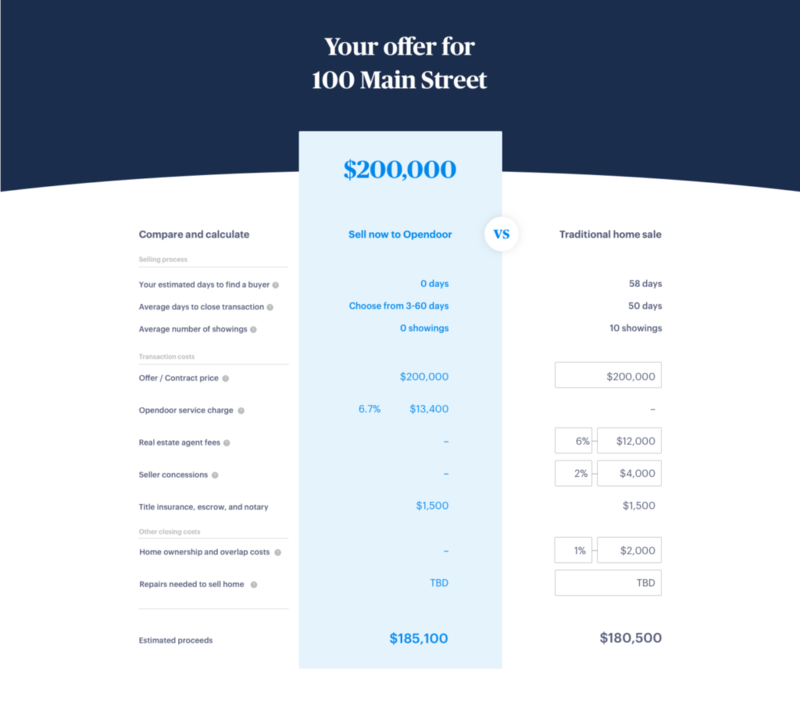 So how is selling to Opendoor different? With Opendoor, you get a remarkably simplified home selling experience with no showings and complete control over your moving timeline. When comparing your service charge to the costs you’d pay in a traditional sale, it’s natural to anchor on the 5 to 6% people typically pay in realtor commissions. The truth is, however, that selling your home on the market actually costs more than this—it adds up to about 10% of the sale price. The misconceptions about the true cost of selling a home might be based on the fact that realtor commissions are the only upfront fee that sellers can see. However, there are additional costs that come into play later in the sale like seller concessions, staging costs, housing overlap costs, and closing costs. When you sell to Opendoor, you avoid many of these costs and get an estimate upfront of how much you’ll make from the sale. In a traditional home sale, the seller pays the commission fees of both their own agent (the “listing agent”) and the buyer’s agent. The total commission in many areas is about 5% to 6% of the sale price, which is often split evenly between the listing agent and the buyer’s agent. 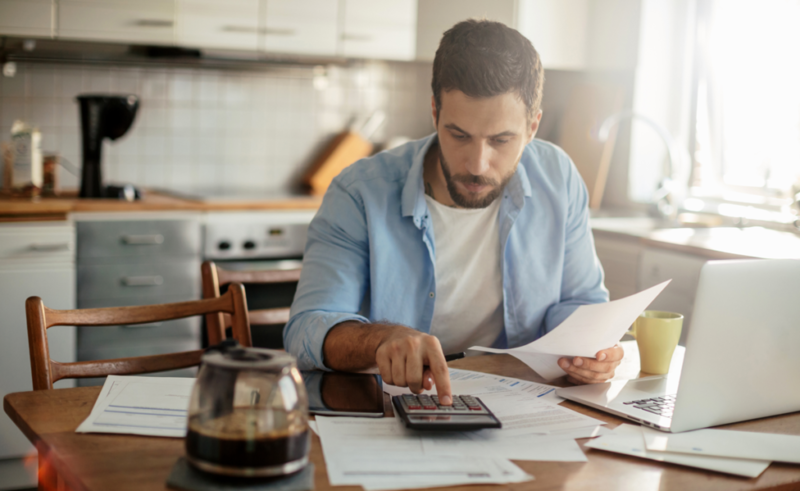 Even if you’re planning to save money by selling your home on your own, you’ll likely still need to pay a commission fee of about 3% to the buyer’s agent. According to the National Association of Realtors, 88% of buyers have an agent. To sell your home, you must get it “show ready”, or presentable enough for buyers to make an offer. Paying to stage your home isn’t required, but it’s common and often recommended. At a minimum, you’ll need to clean and declutter your house and pay storage fees for the furniture you’ll need to hide away while your home is on the market. It’s also likely you’ll invest in cosmetic touch-ups like fresh paint and new carpet. If you have eclectic or outdated furniture or live in an area where there’s a lot of competition, hiring a professional stager may be recommended. The cost of staging varies based on factors like the size of your home and whether you need to rent furniture. There’s no staging, storage, or prep costs when you sell your home to Opendoor. We aim to give you a fair market offer based on the important factors: your home’s features and condition, recent nearby sales, and market trends. You don’t have to worry about clutter or worn furniture affecting your offer. You’ve found a buyer and they’re willing to pay asking price—congrats! But wait, they’re asking for concessions, what does that mean? It’s common for buyers to ask sellers to pay for costs on their behalfs such as inspection fees, processing fees, transfer taxes, and more. The maximum amount of seller concessions a buyer can ask for is determined by the type of loan the buyer is using. For example, the maximum a buyer using a conventional loan can ask for is 3% to 9%, depending on the size of the down payment. Our analysis of home sale data indicates that when buyers in Phoenix, Dallas, Las Vegas, and Atlanta do ask for concessions, they ask for about 1.5% to 2% of the home’s sales price. Buyers usually ask for concessions when they have enough cash for their mortgage down payment but not enough for their closing costs. If you sell to Opendoor, you don’t have to worry about those concessions. After you’ve agreed to an offer, your buyer will get your home inspected for any defects. Most homes that have been lived in will have some needed work just from normal wear and tear. Usually, the buyer will either ask you to make the repairs yourself or ask for a credit equal to the expected cost of making the repairs. At Opendoor, we don’t buy distressed homes; we buy homes in good condition that may need some repairs from normal wear and tear. If you sell to us, we’ll give you an estimate of repair costs upfront and if the home assessment turns up needed repairs, we give you the choice on how to handle them. You can either do them yourself, or we can handle everything and just ask you for a credit to cover the costs, which are often lower because we can pass wholesale savings onto you. One of the most overlooked expenses when selling a home is the cost of housing during the transition period from your old home to your new. If you’re like most people, you’ll need to sell your old home before you can buy a new one to have cash for a down payment. Timelines almost never align perfectly, so you may need to set aside funds to either stay in a hotel and store your belongings, get a short-term rental, or negotiate a lease-back during the months it can take to search for and close on a new home. Even if you are able to move into your new home before selling the old one, be prepared to pay holding costs for the days you still own your old home like property taxes, mortgage payments, HOA fees, utilities and insurance. Our analysis of industry data suggests these costs typically add up to about 1% of the sale price assuming a transition period of one and a half months. With Opendoor, you have full control of the timing of your move—you chose your close date and even have the flexibility to move it if something unexpected comes up. That means no extra spend on housing, storage, or holding costs during that transition period between moving out of your old home and into your new one. When the sale is nearly complete, you’re left with one last set of costs: closing costs. Closing costs cover items like title insurance, escrow fees, and HOA transfer fees. They can range from 1% to 3% based on the different fees and legal requirements for each state and municipality. At Opendoor, we’ll provide you with an estimate in advance. At Opendoor, we empower you to move seamlessly. To cover the costs of providing this simplified experience, we have a service charge that varies based on the individual property and market conditions. This service charge helps us pay for costs normally found in a listing realtor’s commission, like marketing costs and the roughly 3% that we still pay to the buyer’s agent (the vast majority of our buyers have agents). But, unlike your realtor, we have to cover holding costs associated with owning your home. To do this, we forecast the amount of time it will take to sell your home using market trend data. Then we calculate how this will translate into the costs of property maintenance, utilities, taxes, and daily financing interest for each day we think we will own your home. We assume all the risk of the home’s holding costs if the market slows down so you don’t have to. When you get an offer from Opendoor, you know upfront what our service charge will be as well as estimated repair and closing costs. On the offer you receive via email, we include your estimated net proceeds, which means you’ll actually have a sense of what you’ll make at the end of the sale. You’ll know all this information before entering the sale. We believe in showing you everything we can about the costs upfront, even if they seem higher, rather than pitching you on a lower sticker price and hitting you with hidden fees later. Plus there’s no risk–you can cancel your contract at any time before closing at no cost. Besides no risk and no hidden costs, you also get the benefits of a certain sale on your own timeline. Traditionally, you have no idea how long your home will be on the market. With Opendoor, you choose the close date, which means you have more control. This means no paying for transitional housing and no losing out on your dream home because your sale moved too slowly or your buyer fell through at the last minute. You also get to skip the hassle of open houses and showings. You won’t need to spend the average of 10 days it takes to clean and prep your home for listing. You won’t have to treat your home like a museum, keeping it spotless in case buyers want to drop in for an unannounced showing. And, if you have kids or pets, there’s no scrambling to herd and entertain them during frequent, last minute showings. So speaking of costs, how much is your time and sanity worth? For most of us, our home is the most valuable thing we own. It’s important to make the most profit when selling it because it determines how much we can spend on our next home and how much our mortgage payments will be for years to come. But remember: in calculating your proceeds, don’t focus only on upfront costs. Be sure to sit down and calculate how much you’ll spend on all the fees listed above. This will help you figure out your net proceeds, or the amount of cash you’ll end up with after subtracting all the expenses of the sale from the total sale price. Then, besides net cash, ask yourself what other conveniences you value. If you value testing the market, selling through a realtor may be the right option for you. If you value no showings and moving on a timeline you control, selling to Opendoor might be the best option. Each person’s situation is unique, so when it comes to life’s biggest transaction, take into account what’s most important to you.